The Geislerspitzen is located at the end of the picturesque Villnoss valley. 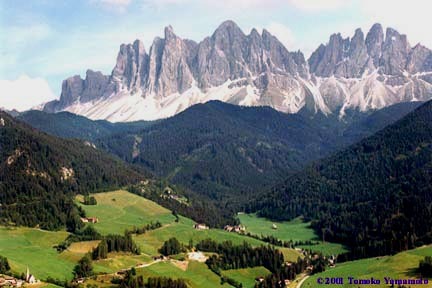 These peaks were the training ground for Reinhold Messner. In this photograph, the church of St. Magdalena is spotted at the left-hand corner. The chapel of St. Johann is spotted in a green meadow at the end of the valley. This small area is called Ranui. I stayed at Tschanduihof for one week in July, 2001 where this photograph was taken. The camera was the Olympus OM-4TBlack with the 65-200mm zoom. The print on Fujicolor Crystal Archive Paper, made digitally (Lightjet print) is signed on the back by the photographer and these prints are estimated to last 60+ years.